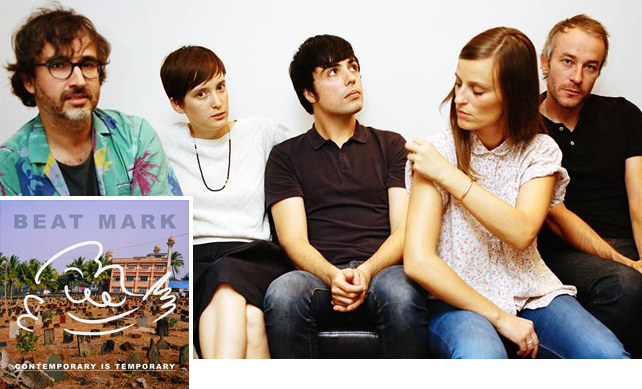 Parisian garage rockers Beat Mark are back with Contemporary Is Temporary (out through Azbin Records). It is a fun ride, starting from the hard-edged fuzz that imbues the addictive 'Acid Faces' through to the loud garage psych growl of 'Teenage Fever' and the rock roar of the title track. It's been a half decade since their Howls Of Joy record, and while the band certainly haven't been idle, it's great to hear such a febrile, punchy effort come out. The entwining, echoed vocals that spiral over the contemplative jangled drawl of closer 'Together' is so warm and inviting, you will wish that Beat Mark wrote your daily theme tunes. I would love to have them as my house band on the strength of this - contemporary may be temporary, but the Beat Mark aesthetic is everlasting. Grab Contemporary Is Temporary here.